Hyundai ix35 Fuel Cell review | What Car? This may look like a regular Hyundai ix35, but under the skin is what could be the propulsion system of the future. While there may be an electric motor powering the front wheels and a battery pack hidden away, you don’t plug this car into the mains. That’s because under the bonnet is a fuel cell powered by hydrogen that’s compressed and stored in a couple of tanks at the rear of the car. This fuel cell is in effect a miniature power station, using clever chemistry to generate electricity. This can either charge the onboard battery or drive the electric motor directly. Should you require maximum power, the ix35 can draw from both the fuel cell and the battery pack together. Maximum output is 134bhp, which equates to 0-62mph in 12.5sec and a 100mph top speed. Unlike a petrol or diesel engine that produces CO2 and a range of other emissions, the only waste products in a fuel cell are heat and water that is so pure you can drink it. And not only is it a clean powertrain, but it’s also quick to refuel: it takes three minutes to fill up, with Hyundai claiming a range of up to 369 miles. While fuel cells aren’t a new technology – they were invented in the 19th century – it has taken a long time to perfect them and make them more affordable. Indeed, while Hyundai has been working on fuel cell vehicles since 1998, this is its first to reach series production. The ix35 Fuel Cell joins the Toyota Mirai and the soon to be released Honda FCV Clarity as the pioneers of commercially available fuel cell cars. What is the 2015 Hyundai ix35 Fuel Cell like to drive? Despite the science fiction-like underpinnings, the ix35 Fuel Cell is remarkably normal to drive. Indeed, those of you that have sampled an electric car will have a fair idea of what this Hyundai is like from behind the wheel. In today's world of keyless go, thumbing the starter button seems perfectly normal, while in front of you is an ordinary-looking fuel gauge that handily also shows your range. The rev counter is replaced by a dial for power consumption that also shows if you’re charging the batteries with brake energy when you’re slowing down. Between the seats sits a gear selector shared with the automatic ix35, along with an electronic handbrake. To set off, just put your foot on the brake, select Drive and press the accelerator. As with any electric car, there’s little to no noise coming from the front, only a whine from the motor if you really put your foot down. There’s only one gear, meaning progress is for the most part very smooth. The only exception is a slight hesitation should you call upon maximum power, but it's no worse than the kickdown in a regular automatic. Low speed acceleration is stronger than the 0-62mph time suggests but soon tails off as you pass 30mph. While power may be available from zero revs, the Fuel Cell version of the ix35 is around 100kg heavier than regular variants. 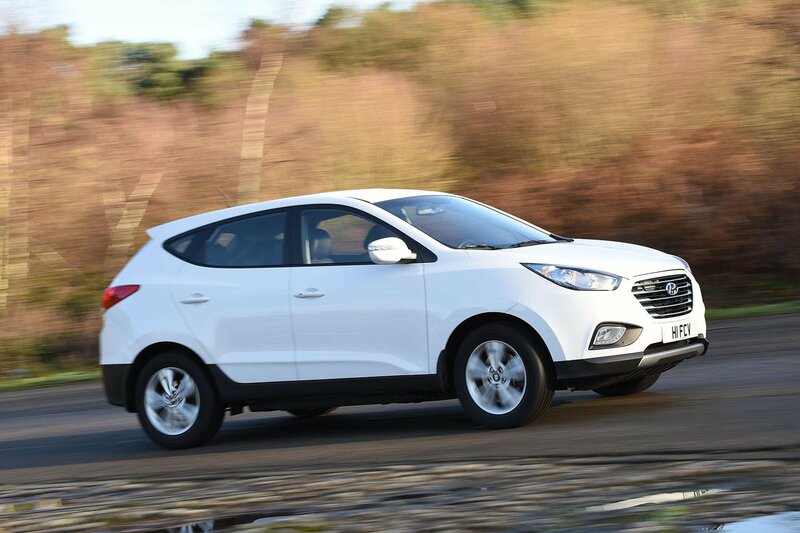 By the time you reach 60mph the acceleration can be painfully slow, although the Hyundai can keep pace with motorway traffic if you’re not afraid to use plenty of throttle. You will watch your range tumble pretty quickly if you do this, though. Like many electric cars, the ix35 seems to work better if you take a more relaxed approach. Not only will smaller throttle openings preserve the range but you’ll appreciate the exceedingly comfortable ride even more. Imperfections in the road are soaked up without fuss and it rides bigger bumps equally well. Despite this, there’s not too much body roll in corners. It may be heavier than a standard ix35 but the weight is mounted very low in the structure. Even so, Hyundai can’t change the laws of physics, so don’t expect it to be fun in the bends. There's little feedback from the front wheels and the stability control is eager to activate. What is the 2015 Hyundai ix35 Fuel Cell like inside? Unlike cars such as the Toyota Mirai, Hyundai has made the ix35 Fuel Cell as conventional as possible inside. In that respect, it’s not really any different from the standard diesel ix35 models, but this has both positive and negative points. The good news is that the cabin is, for the most part, spacious and wholly inoffensive to look at. Getting comfortable up front is easy enough and you sit high enough for a commanding view of the road. Move to the rear row of seats and you find plenty of leg room, although taller passengers may find the sloping roof stealing precious head room. Unlike in the Mirai, there’s also room for five including the driver, although occupants may need to pack light. One of the hydrogen tanks is under the boot floor and reduces load capacity from the 591 litres of a regular ix35 to 436 litres here – not terrible but still significantly smaller. While well equipped with heated leather seats, a touchscreen infotainment system with sat-nav, climate control and a variety of other niceties, there’s no hiding the ix35’s age. There’s no DAB radio, while the cabin does look a little dated with plenty of hard plastics – no surprise given that the basic design is now six years old. It’s also quite tricky to see out of the ix35 at times. Thick pillars front and rear obscure your view of the road, which can make pulling out of junctions tricky. In some ways it’s a shame Hyundai couldn’t have developed a fuel cell version of its new Tucson, as that feels much more contemporary inside and out. If you’re after the ultimate in environmentally friendly motoring yet need something as practical as possible then the ix35 Fuel Cell certainly has an appeal. Assuming you’re able to find hydrogen produced cleanly, it is theoretically possible for it to be a 100% zero-emission vehicle in general use. There’s also no doubt that it’ll do everything a normal petrol or diesel powered car can do. On an extended drive it happily kept pace with traffic and was comfortable at all speeds. As long as you don’t expect it to be fast or fun, it’s a pleasant place in which to spend time. Two things are likely to put you off, though. The first is the price; even with a sizeable discount thanks to the HyFive Project (set up to promote hydrogen cars), it’s still just over £53,000. That’s a lot of money for any car, let alone one that's an ageing design. The second issue is with refuelling. Yes, it’s pretty cheap to buy and fairly fast to fill, but finding a filling station may prove problematic. Even including the couple that are due to open in 2016, there are fewer than 10 hydrogen fuelling stations in the UK. Even worse, most are located around London and the southeast. To put it simply, you have to be really committed to the environmental cause to opt for the ix35 Fuel Cell. If you’re one of those early adopters and you’re not too worried about image, then this Hyundai is probably the most usable of the currently available fuel cell cars.